Feature photo by Foxtongue. Photo above by kevin.j. Fancy a spot of swinging? No, not that sort, I’m talking about something far more thrilling. If you’ve never swished through the air on a bar and two ropes before, now is the perfect occasion to do so; it’s the 150th birthday of the flying trapeze. Back in 1859, an inventive young Frenchman called Jules Leotard began larking about with poles, ropes and rings suspended above his parents’ swimming pool. After several months of crashing and splashing, he’d perfected his new art, and on November 12th he performed the world’s first flying trapeze act at the Cirque Napoleon in Paris. His party trick − which involved leaping between three trapeze bars and somersaulting in mid-air − drew hoards of admirers worldwide. Female fans turned giddy at the sight of him, with several allegedly proposing marriage. At London’s Alhambra Theatre he swung directly over a gasping party of banqueters, sporting a skin-tight, one-piece garment which he’d designed himself to allow free movement − and a big eyeful of muscle. The “leotard” was born. Fast forward nearly 100 years, and “flying” had become a global phenomenon. Safety nets were introduced in the 1870s, and the sport was no longer regarded as a purely male pastime. Where previously it was all about strength, women performers brought a new emphasis on grace and posture − and a few more sequins to the leotards, which were now worn by both sexes. In the early 1950s, a boy from Boston ran off − “with his mother’s blessing” − to join the circus. Entranced by the unique aroma of “the popcorn, the peanuts, the elephants”, and a certain “charming young lady trapeze artist” named La Norma, 15-year-old Tony Steele asked for a job at Gil Gray’s circus in Gainesville, Texas, having taught himself on swings and mattresses at his local YMCA. Of his debut performance, “the first thing I remember is ‘oh, ahhhh, eeeee!’” Like Leotard, he had all the girls screaming. By 1962, the shrieks were louder than ever, with Tony’s death-defying three-and-a-half somersault breaking world records (until then, only a triple had been seen), and catapulting him to the top of his profession. Tony’s top tip for anyone wanting to celebrate the 150th anniversary is the new Festif show, running till March 2010 at Paris’s Cirque d’Hiver, formerly the Cirque Napoleon, where Leotard debuted his original flying feat. Anton Von Ostendorf, of world-famous headlining act the Bull Dancers, will transform into flying trapeze’s founding father, complete with moustache and nineteenth century airs and graces. Or you could go one better, and try trapeze yourself. 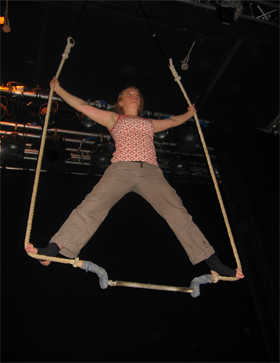 Don’t live in Brighton, there are plenty of other places you can go to learn the lovely art of trapeze: You can find schools in London, California, New York, Sydney Australia, France and Hamburg, Germany. So When I Do This, What Will I Learn? This was “static trapeze” − you need considerable experience before attempting the flying kind − but nevertheless, there was very little keeping still. After mastering basic moves the “pike” and “hock” for ascending and descending the bar, we progressed to the “bird’s nest”, the “star” and the “mermaid”. Later came my favorite, the “spider”, where from standing, you jump your feet around the ropes, lower yourself, let go your hands and drop, arachnid-like, to a dangling position below. Trapeze will extend your life and make you feel happier. Many of my students are middle-aged women whose husbands tell them ‘You’re crazy.’ By the end of the classes they are addicted, and telling their husbands ‘Shove off and mind your own business. It may be some time before I’m summoned to the Big Top − the only gasps I got were when my classmates saw me plummet head-downwards from a poorly secured “ankle hang” − and the bruises the ropes give an inexperienced newbie are far from glamorous. But the thrill of using every sinew of my body, watching the world from upside down, and being the performer, rather than merely the spectator, of an age-old circus act, had me eagerly hanging on for more. 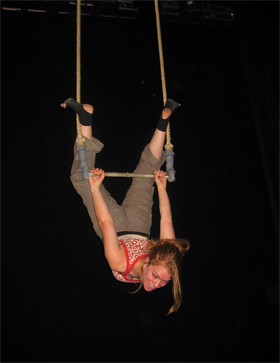 I can’t wait to try flying trapeze, with its daredevil moves − “death somersault” and “reverse suicide” here I come! But for now, I’m delighted to be on the trapeze at all. As Tony tells me, “It’s the most fun you can have with your clothes on”. 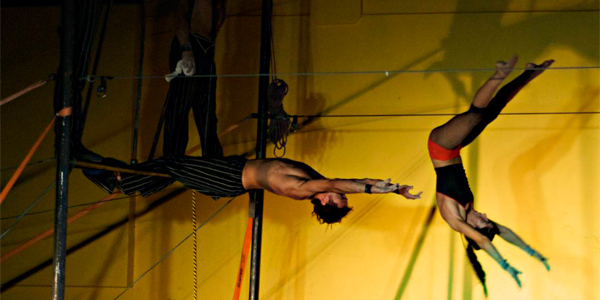 Have you tried your hand (or foot or leg) at the trapeze? Tell us where, when and how it was.